A romatic of orange and apricot with flecks of rosemary and cardamom, Sharon Wallis’ Good Memory tequila concoction is a true original. 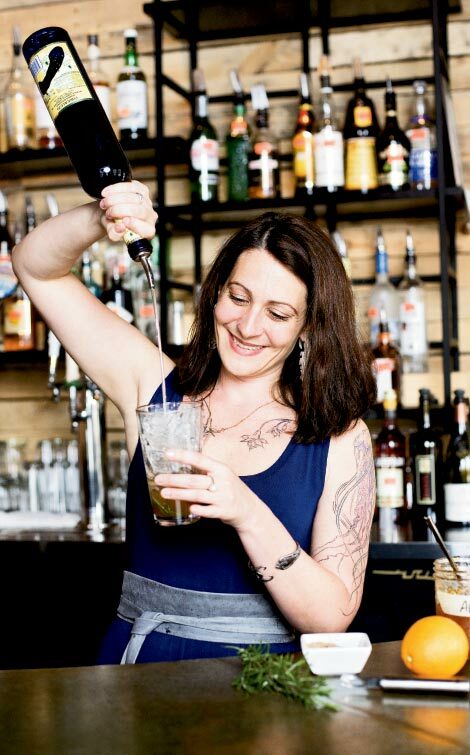 In fact, all the drinks she crafts at The Junction restaurant and bar in Asheville’s River Arts District are her creations, blended with house-made mixes. You can taste the difference in quality: The Good Memory is perfectly balanced, with each flavor distinguishable. The herb, spice, and aged El Jimador Reposado perfectly offset the sweetness of the apricot preserves and freshly squeezed orange juice. The key, she says, is in the ingredients. “Everyone has access to the same liquors. It’s really all about using the best mixers and what’s fresh and in season.” Wallis shops local farmers markets each week for the fruits and vegetables she adds to her creative elixirs. Here, Wallis’ recipe for the Good Memory offers a refreshing kick-off to the warm days ahead. Though she makes it with homemade preserves, she insists any quality apricot jam will fit the bill. Chill a cocktail glass. Combine rosemary, cardamom, preserves, and Licor 43 in a shaker and gently muddle. Add ice, tequila, and orange juice. Shake and strain into cocktail glass. Garnish with an orange twist.